Jump to today link on the calendar! 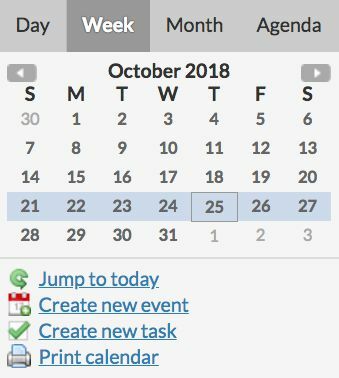 Before, if you were on a different month or week in the calendar, you would have to refresh your screen or click on the “Calendar” button in the navigation bar to jump back to today’s date. Now, you can just click the “Jump to today” button on the left hand side of the calendar! Tons of new tutorial videos! A few months ago, we gave our Beginner’s Guide a facelift. Since then, we’ve also been updating other videos, including tutorials on adding and managing users, our Google Contact sync, contact relationships, and email logging. If you want a notification every time we publish new videos, subscribe to our Youtube Channel! Our importer had some trouble accepting .xlsx files earlier this year (but importing .csv files or .xls files worked). We found a fix, and you can now import .xlsx, .xls, and .csv files without issue! Deduplicating logged emails on merged contacts! Before, when you merged contacts with the same email address, any emails that had logged to both records would remain on the merged contact, so you'd have duplicates under the activity feed. Now, LACRM automatically deduplicates logged emails when merging contacts. You can now delete attachments from a logged email in the CRM! Navigate to the associated contact record, and click on an email. If there is an attachment, you can click the "Delete" button next to the attachment name at the top of the email it in order to delete it. Our Skype Click-To-Call setting works with Skype 8! Skype made some changes to the way click-to-call worked with their product this year, so LACRM had to adjust accordingly as well. Now, our click-to-call setting for Skype works with Skype 8. If you want to try Skype's click-to-call features, change your Click-To-Call setting to Skype on your Personal Preferences page under Settings, and make sure you've downloaded Skype version 8 onto your computer. Questions? Comments? We hope these changes improve your CRM experience! As always, if you have any feedback, we'd love to hear it.